Former Real Madrid president Ramon Calderon has backed Real Madrid's reported attempt to extend Gareth Bale's contract. The Welshman has three years left on his current deal and Real hope to keep him until 2021, when he will turn 31. "It's quite reasonable that they are offering him the contract extension," said Calderon. 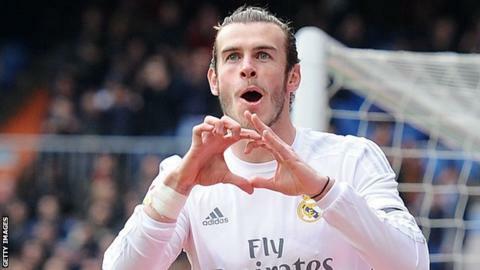 Bale became the top British scorer in La Liga against Sevilla on Sunday, taking his tally to 43. It came during a season that began with Bale being linked with a return to the Premier League at Manchester United. Calderon says the interest of clubs such as that is understandable, but as player, club and fans are happy, he does not "see any reason for him to leave Real Madrid". But he also doubts Real would be tempted to sell, even if rivals would be prepared to "break the bank". "We are not a selling club. We are a buying club. We've got him and we'd like to have him for a long, long time," Calderon said. "It's not unusual. No doubt a lot of clubs in Europe would like to have him. He's a top player. "He's showing that here with Real Madrid. He's scoring goals and playing quite well. "He did it very well against Sevilla and everyone here is very happy, so it's quite reasonable that they are offering him the contract extension." The Cardiff-born player left Tottenham Hotspur for Real in a world record £85m move in 2013. He has since combined starring for Real with helping Wales to reach Euro 2016, their first major finals since the 1958 World Cup. But Bale will miss Wales' warm-up friendly against Ukraine on Thursday, 24 March at Cardiff City Stadium and the trip to Ukraine that follows four days later. A calf injury has dogged Bale this season, prompting Wales manager Chris Coleman and Real counterpart Zinedine Zidane to agree he would stay with his club for the time being. Calderon believes club and country have done the right thing to help Bale return to peak fitness "little by little, step by step to be in the best shape at the end of the season for Real Madrid and for Wales". The impending birth of Bale's second child has also contributed to the decision for Bale to be absent from Wales duty.